Gordon Harold Smith (born May 25, 1952) is Oregon's former United States Senator. He is a member of the Republican Party. Smith was the only Republican holding statewide office in the largely liberal state of Oregon. He is a member of the moderate Republican Main Street Partnership. In December 2006, Gordon Smith spoke out against the War in Iraq for the first time, after having voted in support of it four years prior. Smith said that to continue the current policy in Iraq "may even be criminal." He was one of only two Republicans to vote for a resolution aimed at withdrawing most American combat troops from Iraq in 2008. On social issues he's known to be more of a conservative. 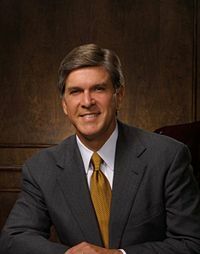 Smith was given a 15% rating from the pro-abortion group NARAL, indicating a pro-life voting record. However, he does support embryonic stem cell research. He also voted for the 2006 Federal Marriage Amendment.